(Newser) – South African sprinter Wayde Van Niekerk set a world record Sunday night in the men's 400-meter race, an Olympic feat that the Washington Post says "no one saw coming"—except, perhaps, for the 74-year-old Namibian great-grandmother who trains him. Van Niekerk first caught the eye of Ans Botha, who's been a track and field coach for half a century, at 2010's IAAF World Junior Championships, and she started coaching him two years later, Quartz notes. He's managed to get four seconds faster in the 400-meter competition since she took over his training regimen. 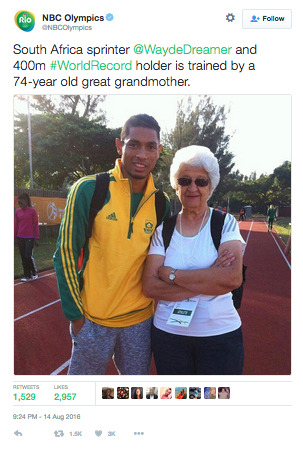 Fastest South African man was trained by someone's great grandma. Gross, but impressive for an old bird.